I had good intentions on posting Friday, but then, on a whim, decided to recreate a dress that had be in my brain all night. I had seen a (music) video on Thursday – I love the song so much that I watched it repeatedly. There’s always LOTS of costuming going on with this band and I found myself thinking about how I could re-create this actress’ dress for myself. By Friday morning, I had it plotted out in my head and was already whipping up a muslin…. and by the end of the day, I had completed the dress! So how did I do it? Here’s a bit of the lowdown: I wound up using two patterns, Jalie 2805 (the turtleneck version) and the Lisette (3883). In hindsight, I probably could have skipped using the skirt pattern since the top is pretty much just brought down into a straight line (it’s shaped a bit, but not that much), although it did give me a good judgement as to how long I needed to make it. As for modifying the top, I essential cut the front portion of the pattern in two to create the cutout: the lower section is just above the bust while the top portion is a triangle. After creating finished edges, the front pieces are overlapped and treated as one piece. I left off the sleeves and hemmed the raw edges. I made the gloves by tracing my arm, adding a seam allowance and sewing. As a side note, it’s probably a good idea to trace your dominant arm as I found that mine is slightly larger (and fit is a bit different). 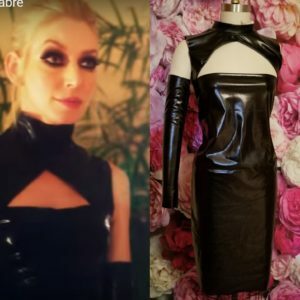 As for fabric, my initial mock-up was a bit of stretch pleather that I had leftover from a Halloween catsuit – it had a wonderful stretch and drape (not to mention a heavy shine), but unfortunately, there was not enough to make a full dress. Since I didn’t want to order fabric, I headed to the costume section of Joann. After much waffling, I decided to skip their stretch pleather (even though it has a great shine, the stretch recovery is a bit off and it feels like a cheap raincoat) and went with a black metallic stretch instead. This material had a much better stretch and recovery, but far less shine. It feels more like a fabric, but you’ll still need a Teflon foot to sew with it because it has a bit of tack like pleather. Overall this was a fun, inspired sew! I am seriously considering wearing this to their concert this weekend, but we’ll see if I chicken out in the end. This entry was posted in Uncategorized on October 22, 2018 by stacy.